Diego Cabezudo is the cofounder and CEO of Gigas. He earned a degree in Telecommunications and Electronics from University of Navarra in 1996 and then joined Telecable, a new but well-funded telecom operator. 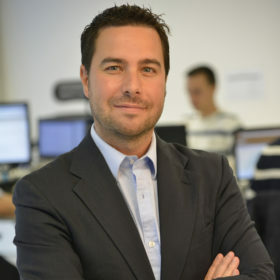 After 5 years, Diego moved to Fujitsu Consulting (formerly DMR) as Management Consultant and later joined mobile operator, O2, as Head of Strategy. He was invited into the company’s leadership program, one used to groom CEO potential employees, and was sponsored to attend London Business School’s Executive MBA program. Diego then joined FON Wireless as their COO and helped the company raise $18M from investors including Sequoia and the founders of Google and Skype. In 2009, he became CEO of AGS, a Spain-based multinational technology consulting company. AGS nearly tripled in size under Diego’s leadership, employing 300 people and increasing from $9M in revenue to $22M over just two years. Throughout his career, Diego consistently struggled to find professional cloud hosting services. The local companies that existed did not have cutting edge technology, while the US providers did not provide enough customer support to gain the trust of SMEs and corporates in Spain. In January 2011, Diego and a coleague from both FON and AGS, put their head together and decided to build the service they had been searching for. Diego raised $1.2 million in seed capital and launched Gigas with a team of 15 people. The company broke half a million dollars in revenue during its first commercial year and raised a Series A1 and A2 round of $4M which funded its second data center in Miami. To raise a larger round of capital and gain credibility, Gigas went through an IPO on the Mercado Alternativo Bursátil (Spain’s Alternative Stock Exchange) in November 2015. Today the company caters to 3,600 clients from seven offices, five in Latin America and one in Miami, in addition to four data centers. Cloud computing has enabled businesses to dramatically lower their cost of operations. Gigas’ cloud platform pairs advanced technology with exceptional customer service for SMEs and multinational corporations in the Spanish-speaking markets. Its platform is flexible, scalable, and user-friendly which has attracted a loyal customer base of nearly 3,600 businesses and has facilitated its expansion to seven countries worldwide. Gigas is the leading locally-based cloud computing company in Spanish-speaking markets. Gigas provides exceptional technical customer service, flexible product options, and consultation on local legal and regulatory nuances. It offers two products–the Cloud Virtual Private Server (VPS) and the Cloud Datacenter. Many traditional Latin American SMEs and corporations are uncomfortable with pure IaaS cloud solutions and appreciate Gigas’ client support team which is fully bilingual, available in both Spanish and English (24/7 by phone, chat, email), and provides guidance on migration to and integration of cloud services.